One type of forklift is the man lift, which is used on a variety of worksites to increase the efficiency and productivity, while ensuring safer working processes when operated by employees with a man lift certification. Man lifts are used every day in warehouses, construction sites, lumber yards and other industrial settings. And just like forklifts, pallet jacks and aerial lifts, your manlift operators require the proper training, which means OSHA man lift certification. If your workers lack basic man lift training, lost productivity is only the start; your employees are also more likely to be involved with accidents. If your worksite is visited by OSHA and your man lift safety program isn’t up to speed, expensive fines and negative PR from costly legal action are just a few possible outcomes. Make sure your workers are given the best opportunity to succeed – and be safe – with OSHA-compliant man lift certification from CertifyMe.net. CertifyMe.net offers an affordable solution to expensive training. Our courses are taken online at your convenience. We’re the ideal OSHA compliance tool for busy companies that need to get their manlift operators certified. Sign up today and let us handle your manlift training requirements! What is a Man Lift? Before you consider manlift training and manlift certification courses, it helps to answer a basic question: What is a manlift? According to OSHA, a man lift is a revolving device consisting of a power-driven endless belt that moves in one direction. It has steps and landing pads at the entrance and exit of the belt with handholds for workers to keep themselves balanced. 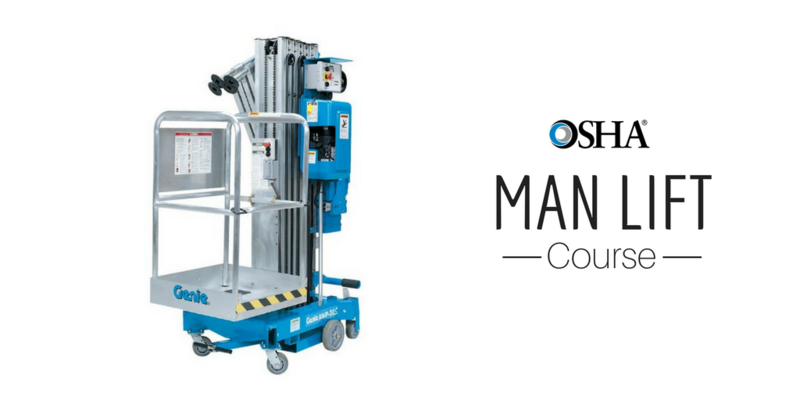 Man lifts are designed to carry workers from floor to floor in a safe and efficient manner, often in parking garages and construction sites. Only employees have access to man lifts, and they come with their own safety protocols for personnel to avoid accidents. You many have noticed manlifts in big box retail and home improvement centers like Home Depot, Lowe’s, and similar outlets. All of these workers are required to receive manlift safety training, per OSHA’s manlift training requirements. What Are Some Manlift Jobs Available? Manlifts must be operated by those who are skilled and trained to use them and guide workers to use them safely. It is a manlift employee’s job to ensure that safety hazards aren’t present when a manlift is being used on a worksite and that injuries and fatalities aren’t likely to happen. What Classification is a Man Lift? Man lifts are classified under section 1910F on the OSHA website, in the subpart titled Powered Platforms, Manlifts, and Vehicle-Mounted Work Platforms. A man lift falls under this category because it is not an actual machine used to handle loads or pallets, like aerial lifts or forklifts. Manlift training is mandatory for all employees who use one – and it’s the employer’s responsibility to deliver this manlift certification. With CertifyMe.net, we’ll handle all of your manlift training needs. Register today and gain OSHA compliance – it’s the best thing you can do for your employees! According to OSHA training guidelines, all manlifts require thorough training and an on-site evaluation (by the employer) before any employee can operate the equipment. Basic manlift certification and training is similar to forklift training. All manlift safety training expires after three years, at which point renewal training is required. With CertifyMe.net, all of your manlift training and certification needs – including renewal training – is taken care of! All manlift training requirements are accounted for with our safety training certification courses – browse our catalog and select the manlift training you need! What Are the Dangers of Manlifts? Because manlifts are constantly moving platforms, they can be dangerous if operators haven’t been trained to use them. The thought of stepping onto a moving platform can be scary for many workers, and that fear and hesitation can lead to accidents. A few years ago, there was a young man who had just started his new career on a worksite. He was about to use the manlift for the first time, without having received any training. The young worker was already hesitant to use the manlift, and when he stepped onto it he got a part of his shoe stuck on a component of the manlift and slipped and fell multiple stories. He suffered serious injuries, but could have been killed by this accident. Do I Need a Man Lift Certification? Even though man lifts are not designed for loading, unloading, and carrying materials, they are used on a daily basis in many construction and maintenance sites and come with their own unique set of safety procedures and hazards. Where Can I Get a Man Lift Certification? Completing man lift certification is just as important as completing forklift or aerial lift training. CertifyMe.net offers an online program that teaches workers how to be safe on the job and rewards them with an OSHA-compliant man lift certification. In addition to learning what is a manlift, students also learn how to use a man lift safely, the hazards to look out for, and how to prevent injuries and fatalities. For only $59.95 and one hour of training, you can have the tools you need to be safe and productive on the job. Get your manlift training today with CertifyMe.net! Our OSHA forklift training is one of the most popular online courses for companies all over the United States, and our man lift training offers the same convenience, affordable prices and flexibility. Don’t delay your manlift safety program one more day – sign up today with CertifyMe.net, the leader in OSHA compliant man lift certification programs.